Sorry to get this post up somewhat late, the afternoon has been somewhat hectic. Slovenia once again had an extremely strong project and in the opinion of the judges were deserving of the grand prize. Slovenia developed some very nice vaccine technology to fight Helicobacter pylori. The first part of the project was to engineer a live Helicobacter strain that expresses an antigen to trigger both the innate and adaptive immune response. The second half of the project involved engineering a constitutively active variant of TLR (toll-like receptor) to remove the requirement for receptor agonists. The latter has the potential to be a novel general strategy for developing vaccines. Congratulations also to Freiburg and Caltech who were first and second runner’s up respectively. Thanks are due to the organizers and the judges for such a well-organized weekend. 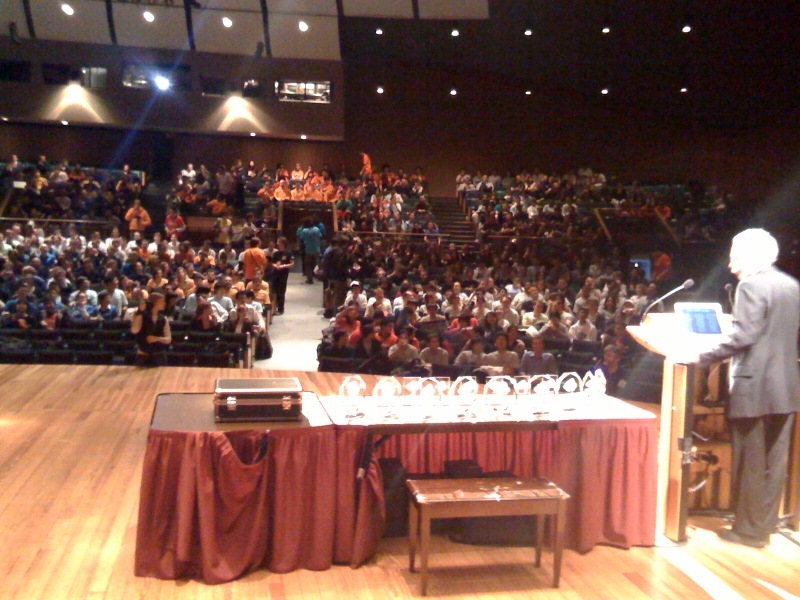 (The image above shows some of the crowd during the award ceremony and Tom Richard, head judge, bathed in light). Keep up the great work. The future depends on you! If you want to hear a reader’s feedback 🙂 , I rate this post for four from five. Decent info, but I just have to go to that damn google to find the missed bits. Thanks, anyway!